If you want to see some skeletons, get yourself to Rome! Specifically, get yourself to the Capuchin Cemetery. 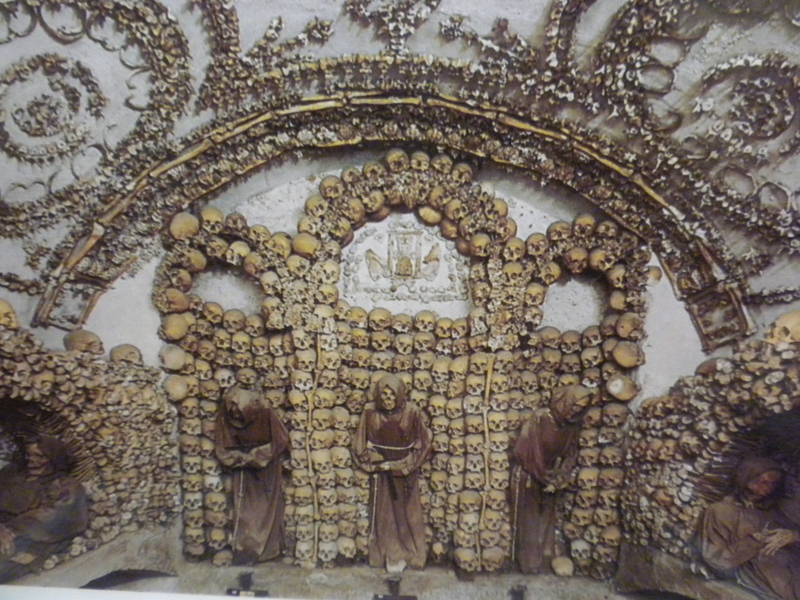 No pictures were allowed in the crypts so I purchased the guide book and took pictures of the pictures so you can enjoy the artwork of pelvis bones. The pictures do not do justice to they crypts, but you can get the idea of rooms full of bones, painstakingly arranged into stars and flowers, winged skulls and hourglasses, and even chandeliers! While the actual catacombs did not have any skeletons in them, they were still pretty creepy. 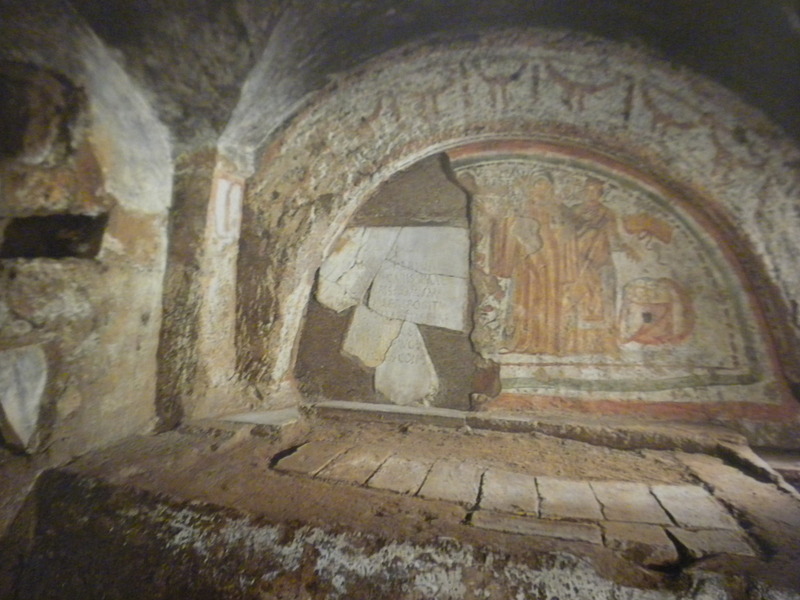 The thing that surprised me most about the catacombs were the frescos. The tunnels were completely frescoed, and some of the frescoes can still be seen. I could not take pictures in the catacombs either so these are pictures of pictures. 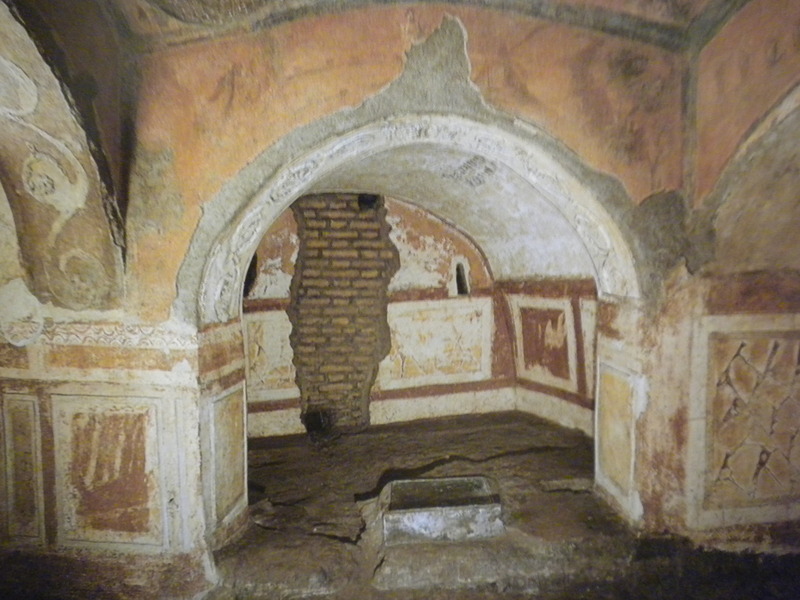 The catacombs were ruined when Rome was sacked. Because the catacombs were so beautifully decorated, the invading armies thought the bodies were buried with treasures like the ancient Egyptians. Each body was sealed into its hole with a large slab of rock or marble and the family name with dates was carved on the slab. Almost all of these slabs were destroyed in an attempt to get to treasure, but these bodies were simply covered with a shroud, no riches were buried with them. The last stop on my tour of crypts and catacombs was the church of St. Clement. This is a 12th Century Basilica, built on top of a 4th Century Basilica, built on top of a 1st Century Mithraic Temple. This church was absolutely beautiful and the artifacts inside were so interesting. The story goes that the Mithraic Temple and 4th Century Basilica were completely forgotten until 1857, when a Priest, Father Mullooly, decided to start digging because the sound of rushing water was keeping him up at night, and he was sure it was coming from under the church. Once he started digging he discovered the 4th Century Basilica, but no water so he kept digging. Then he discovered the Mithraic Temple, and finally he found the rushing water. The water was forming a lake under the church and Father Mullooly developed a drainage system. The water still flows today in the Mithraic Temple, the source of the water is still unknown, but that didnt stop me from having a taste for good luck! Don’t worry, it has been 6 days since I drank the water and so far no third arms or strange diseases have appeared so I think I am fine. This fresco, located in the 4th century basilica, is very significant because it is the earliest known example of the Italian language being written, it is even more interesting because the Italian that is used is a very vulgar expression and this is a fresco in a church. 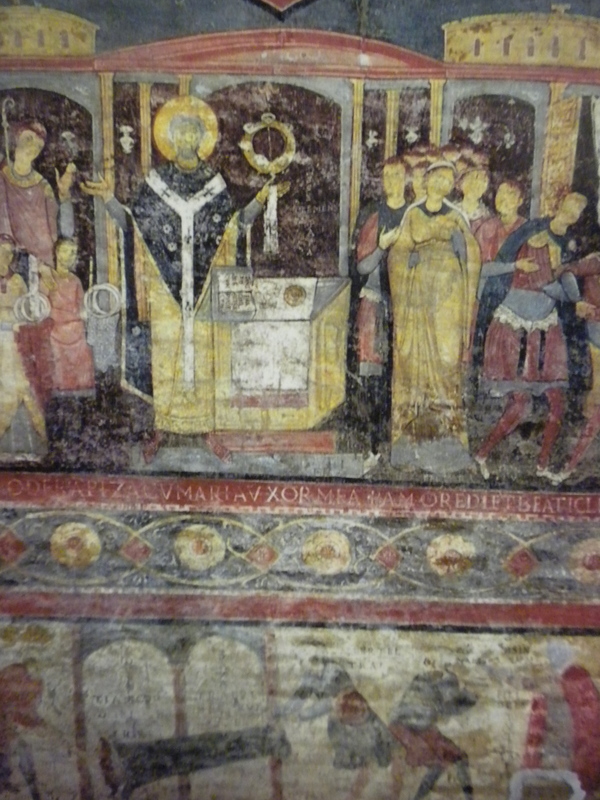 The phrase is on the lower right hand corner of the fresco but this picture does not show it well. The Italian phrase is: “file dele pute”, I will let you translate that for yourself. 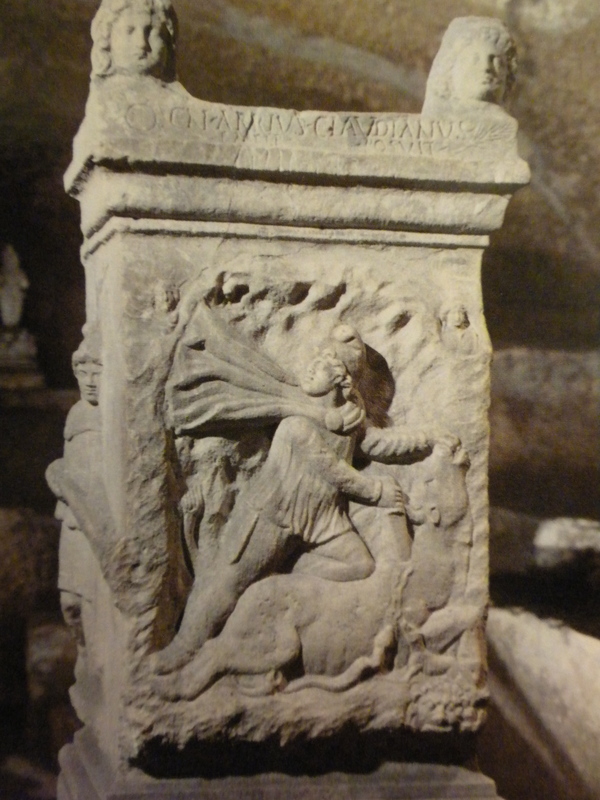 This is the centerpiece of the Mithraic Temple, a small males-only cult that died out as Christianity began to rise in Rome. What I found interesting was that the Mithraic rooms were not destroyed when this building was converted to a Basilica, the entrances were only bricked up, which is fortuitous from an archeological standpoint. And now that I have talked at length about bones and dead people, I am going to go to bed and dream about… probably bones and dead people. Sweet dreams everyone! This entry was posted in Uncategorized and tagged Churches, Italy, Rome, Travel. Bookmark the permalink. Cool pics (of pics)! I like the skeltons. Capuchin…Capuchin…where else have I heard that? Is there a movie or book about those friars? I hope you get to see it for yourself, it is very cool! Where in Italy would you like to visit? Ah, lots of places. Milan (because my favorite soccer club is there), Turin (I don’t really like Juventus, but I heard the city is wonderful! ), Roma, Vicenza-yes, your place! :-), Venice, Napoli, Bologna, and… Florence. Yeah, definitely Florence is a must. These are places I’d like to visit.